Dynamic Footy Skills coaches are experienced at the highest levels of footy. Our highly regarded coaches, coaching practices and philosophies are widely sought after. We are considered as the leaders in our industry and have been recognised at AFL level, exclusively partnering with the North Melbourne FC to design and deliver the NMFC Next Generation Academy. We are the ideal partners to arm your coaches with the knowledge and tools to help players of all ages and abilities get the best out of their footy. 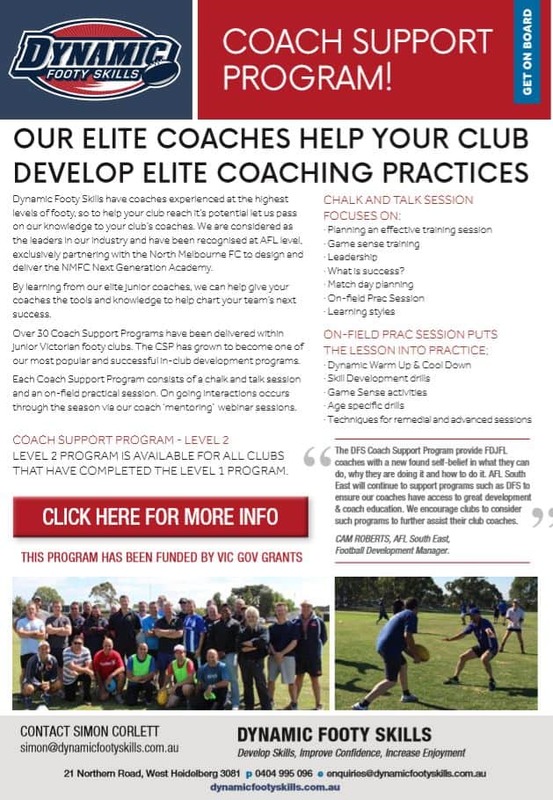 Our Coach Support Program is recognised as the premier AFL junior program in Australia. We have assisted over 35 junior clubs and leagues, including AFL South-East / FDJLFL and over 600 junior coaches in their pursuit of providing the ultimate experience for their junior members and families. Game Sense training – What is it really ? The CSP can be held any time of year. We conveniently come to you and your club – so your coaches and staff don’t need to travel. Our CSP has been approved for government funding. Please contact us today to discuss how and when we can help your club.